The Liberal government is signalling its plan to stem the flow of asylum seekers crossing into Canada at unofficial entry points with a new border-enforcement strategy aimed at detecting, intercepting and removing irregular migrants. Finance Minister Bill Morneau said today the government wants to ensure Canada's asylum system is fair and effective, and governed by the rule of law. "That money was put there in order to ensure we have appropriate border security approaches but also improve the processing speed for immigration Canada," Morneau said during a press conference at the Toronto Region Board of Trade. "So if someone comes across the border (and) claims asylum, we want to make sure we process that quickly so they either are moved back to where they came from, if it's inappropriate, or in the case where they are legitimately seeking asylum, we deal with them in a compassionate and rapid way." 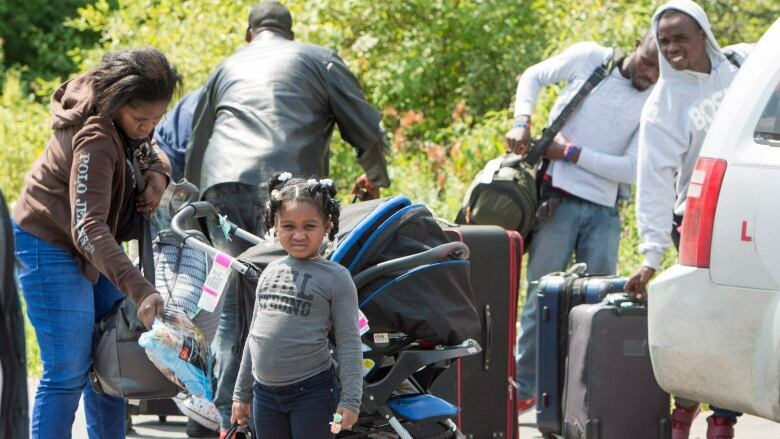 More than 40,000 asylum seekers have crossed "irregularly" into Canada over the U.S. border since 2017 — avoiding official border checkpoints where they would have been turned back to the States under the Safe Third Country agreement between the two countries. The new border enforcement strategy will add resources to strengthen border security and speed up the processing of claims. It also promises to prioritize removing asylum claimants who entered the country irregularly. The Trudeau government also is planning to crack down on a rise in anti-immigrant sentiment in Canada with a new anti-racism strategy, complete with a $45 million budget.